I cut a size 40 neckline and 42 for the rest and couldn't work out how to do the FBA -- well, what to do with the dart on the other side. Honestly, I could have left it because this fabric doesn't show the diagonal seamline at all and a dart would've been hidden. But if you didn't want a dart then what? Well, perusing the Russian Burda site (translated! ), someone said something about an adjustment in the seam line. Ah-ha! On the right side the dart would be rotated into the gathers and on the left you could leave the dart or rotate it into that seam line! So I will do a small FBA next time. This time I did a small, cheater FBA. I sewed the diagonal seam at 5/8" at either end and a scant 3/8" through the center. I sewed the side seams at 3/8" through the bust -- but not the underarm or the waist. This meant to be fitted and too loose = saggy gathers. Per my usual, I did not add hem allowance. I did add hem allowance to the sleeves and I like where they hit. I ~love~ the neckline. I traced, cut and sewed this top in an evening. I was TOO excited! 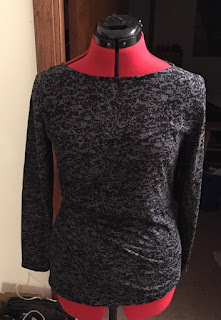 I was ready to make one in olive but then decided to stay on track and sew my black V1595 dress next. The pattern recommends ponte or similar - use ponte. I used a sweater knit with a loose-ish weave and wahhhhhhhh. I had to take it in so much. I was really on the fence before realizing the issue was that it was just too big on me. And finally got back around to it Monday to work on the lining. Who wants to unpick black stitches from black tricot?!?! THEN, I woke up Tuesday with a migraine (unrelated to the dress, lol!). I ate stupid, stupid, MSG-laden Doritos on Monday with dinner (maybe it WAS the dress' fault?!). The migraine finally broke Wednesday night. Blergh. I fully intended to do BPSewvember! I almost always do! But I fell behind a couple of days, caught up, then fell behind again and said, forget it. Wah. It seems difficult for people to comprehend that different people lead different lifestyles and therefore have different clothing needs. Be that garment types (e.g., I don't need party dresses and someone else will not need the half-dozen lined straight skirts I have in my wardrobe) or wardrobe size. So what about you? Is sustainability a focus with your sewing? If so, what does that mean to you? Is your sewing heavily influenced by social media? I sew what I like. I sew slowly because I have the time (retired) & I enjoy most of the process. I usually wear shorts, skorts or jeans, tanks, tshirts & button downs. I enjoy reading your posts & seeing the pictures. Your explanations of how you've made a pattern, what works & what doesn't and if a pattern is crap are spot on & helpful. Plus you usually have a way around a problem that I can use on one of makes. 😉 Dont worry about what other people say honey they're bored & have nothing else to do. Keep sewing & being you. Aww thank you Becca! I have so many people who I follow because of those reasons -- they are very detailed, they discuss the sewing (vs just pretty, pretty pics), their blogs are interactive -- I never once think about judging someone's output or fabric choices or anything! I feel similar to you about recent Burda issues. I mean, they're fine! I'm just not like MUST HAVE INSTANTLY about anything. I do think there are probably patterns in there that I'll come back to at some point, but for now I'm not in a mad rush to make anything in particular. I don't particularly sew with a sustainability goal. As you know I spent a lot of time thinking (& blogging) about the size and shape of my ideal wardrobe. My current wardrobe is much smaller than it once was and I'm pleased with it. However, I'm not pleased because I think there's any intrinsic virtue to having a smaller wardrobe, but because I brought order to chaos. The stuff I owned that I culled was frustrating, not fun. It was a lot of stuff that I didn't like, didn't fit or just didn't work with anything else I owned: a whole heap of wasted money and space. Where I have perhaps accidentally wandered into "sustainability" territory is that at this point I have figured out how many garments I need to be satisfied by the range and variety in my wardrobe, and I stick pretty rigidly to that quantity. Also, I like the things I make or buy to last a decent amount of time, so I am interested in sewing, in particular, in a way that at least allows for the possibility of longevity. I don't pretend I'll save the planet this way at all. I also don't pretend that my wardrobe size would necessarily for a single other person on the planet. It's so dependent not only on a person's lifestyle but also what they want from their wardrobe -- how much variety/colour/interest. I know I'm not variety seeking in the same way as some people I follow, and that lends itself to a smaller wardrobe, but for sure I don't think I'm more virtuous as a result. Exactly!! They are fine and I'm SURE that in a couple of years I will be gaga over these issues :) Burda has a way of doing that to ya! I remember your wardrobe series! It was so enlightening and fun to watch the process evolve. And agreed...we have to do what works for us and for some people that's a lot of colors, prints, textures, options!! And others will prefer a simple, pared down wardrobe. It's all good! Gurl I feel you on M7833 - so many of them hurt my eyes and my style sensibilities. SERIOUSLY! And I sew what I want. It's why I've put a moratorium on buying patterns also why I no longer tag the pattern companies when I make a garment. I'm sewing what I want not what you're pushing to other sewists. You are not cranky. You know what you want. You know what you want to sew and you have a point of view. Plain and simple. It's one of the things I adore about you. I know I should care about sustainability and I know people can do more than one thing at a time but right now I feel like the world is going to hell in a handbasket and who gives a f*c* about sustainability when we're not going to be around to use it. Yeah I'm in a mood! Finally things go around in cycles. You will love Burda again...just give it a minute. YESSSSS I've generally stopped tagging too. And that. That. That. I am secretly (not really) not so "omg the environment". Not because I don't *care*...but I don't think we're going to outlive planet earth. Just like the lifeforms that came before us...eventually, our time on this planet will be done. Are we speeding that up? Maybe. IDK...But I can't see how paying $30/yd for organic cotton jersey is going to help. LOL!!! Yes. I just commented that up above! I have gone absolutely crazy for the September/October 2014 issues recently. The beauty of collecting the mags. I better not put my version of M7833 on IG as I wouldn’t want to be responsible for you leaving IG :-). I sew what I want and what fits my lifestyle, but that doesn’t mean I can’t appreciate and admire what others sew that I’d never wear. Social media may draw my attention to a pattern I may not have noticed but it doesn’t make me think I must have the pattern. And Burda...I miss getting the issues where I wanted to sew almost everything! Same, same, same. I *love* seeing what other's sew regardless of if I think the pattern or style will work for me. I just love the happiness that our hobby brings to us all! I like enjoying that without all the noise. I am getting addicted to your blog! What a GREAT post! Hmm, influenced by social media re what I sew? I admit, I used to be. But luckily, I eventually figured out that I had to forge my own fashion path because a lot of styles others were sewing looked terrible on me. Just TERRIBLE! These days, if I see a style that someone's sewn that I really like, I will probably try to figure out a way to make it work for me, but if I can't, then I'll just accept that it wasn't for me. I still enjoy looking at what others are sewing even if what they are making is not something I'd ever wear. But influenced by social media re fashion that I'll sew for myself? No, not me. McCalls 7833? 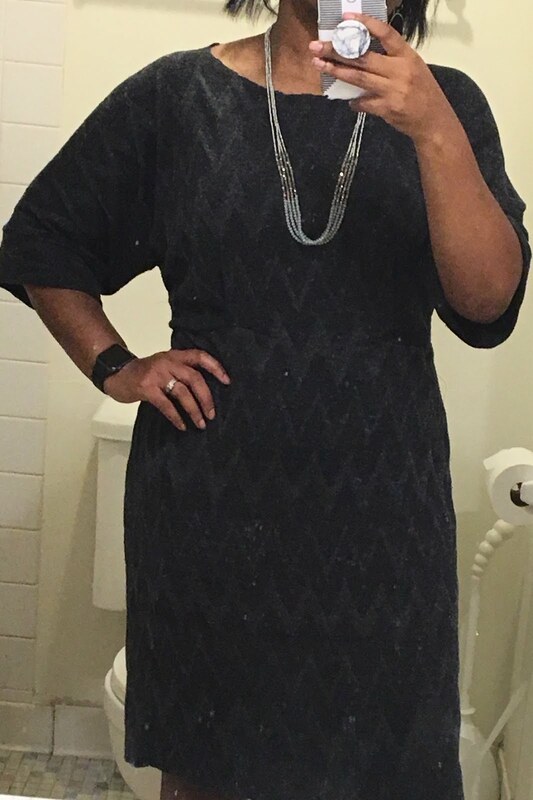 I haven't sewn it, but I do love the ruching and shaping of that dress - not because I saw versions that others made, but because fitted dresses like that are very flattering on my figure type. I actually researched my figure type not too long ago, and I've been very happy with what I've sewn when I've followed the style rules for my figure type. McCalls 7833 falls within the rules for me. I have to say, though, that Simplicity 8787 is similar and I will probably sew that one instead of M7833. And re judgmental people who ask rude questions or make rude comments? IRL, I have no problem putting them in their place, politely. But on the internet, I ignore rudeness because I don't know who the rude person is. Might be a crazy person. Sadly, if there is too much judgment going on in the sewing arena, it will put a chill on others' willingness to share what they've sewn. I don't read too many sewing sites or blogs, and am not on Pinterest or Instagram very much, but if there's a lot of judgment going on there, then all I can say is that people just need to chill if they want to keep seeing what others are making and reading about how they made it! And lastly, I don't think you're cranky. Opinionated, yes, and there is nothing wrong with that. From what you wrote, you respect the diversity that's out there in the sewing universe. That some people don't even seem cognizant of that diversity is what bothers you. Lack of respect for diversity would bother me, too. The moment I saw that pattern, I wanted it! I love it!!! I bought it! And yes, so important to find out what works for your body and your life/interests. And just general styles. I always talk about Moto jackets. I really love the look. I have sewn a few and I just don't like them on me. So I have to admire them but know they don't make me happy so I shouldn't waste time sewing them. I love that! Just tune 'em out and ignore!! I LOVE THE DIVERSITY!!!! That's the good part! I can ooh and ahh over a sewers vintage look or another's satin gown. I can appreciate a hot dress or a tailored suit. Keep seeing, keep blogging! Sustainabily? I don't think home sewers can make much of a dent compared to the amount of fabric big clothing companies use! Right? I mean, curbing waste is a good plan for anyone but I just don't see how it can make that big of a difference except to my wallet. A couple of years ago I asked myself, "when did minimalism become next to Godliness?!" That was an ANNOYING era (I know it persists but not as ubiquitous as a few years ago). There is a lot of privilege and judging and haughtiness around it. Not from everyone of course, but it is definitely there. Great top and dress! Bathroom selfies rule (or at least that's what I tell myself). Re sustainability - I think we (the world) do use far too many 1-use disposable plastics/crap that don't need to be plastic or non-biodegradeable but I don't think clothing is disposable in that same sense. I get a LOT of wear out of my clothes because I sew/fit them well ... and use a lot of synthetics that last. Even RTW that I buy gets worn many times. I don't want to be preached to about what/how/when I use something. I don't care if others explain their philosophies on social media. That's their prerogative/right. But I do often give a side-eye to those who think they are being oh-so-sustainable by using [whatever] without balancing the production ills of said [whatever]. Even recycling itself is a drain on our environment, with the collection, processing, and yes, still landfilling, for a lot of what's collected. But it makes everyone feel good for the moment so most people don't dig into the actual realities (which is true about most things, not just being "green"). And the preaching annoys. I have a lot of clothes. I live in a place with 4-ish seasons and want/need a lot of options. I wear my clothes. I can say, without a doubt, that my full wardrobe is worn more now than it was before I started sewing because I don't have to settle now. It's a love hate thing with me and sewcial media. I don't want to live without it but sometimes I need a break. I think part of the problem is that it's hard to have a conversation without sitting next to the person. The good news is that the things that irritate me have taught me things about myself and hopefully make me aware to be kinder and more patient. I am not interested in all the sustainability posts but I think it does chink away at my psyche and influence my life in all areas in addition to sewing. We are a wasteful society generally speaking. I 100% agree with everything you've said. Humans ARE wasteful; especially those of us in 1st world countries. And that it's always important to reflect. Someone else summed it up that the annoyance for me is the desire for "sameness" and not respecting the (awesome!!) diversity of this community. Interesting about Burda - I think because I'm a new subscriber (less than a year) I see a lot of stuff I would like, and the recent issues has some nice jackets etc. But I think if you've been reading it for a while you probably notice some repeats. also I always am meh on any new release, be it Burda or big 4, and then a few weeks later see items I like. As for following others - I rarely make the popular patterns and have been sewing for so long that I know exactly what I want to make. I'm looking for complexity in my sewing as that's what keeps it interesting for me. Sustainability - I think my sewing is a small issue compared to driving, packaging of products in plastic etc which is where I try to focus my efforts to use less. Wow, you have generated a lot of comments with your questions. Obviously I have not paid much attention to conversations regarding sustainability and sewing. I had to read through some comments to realize what you were referencing with sustainability. I don't relate the two together; I am concerned about plastic usage; I do use a lot though. I do lots of recycling now only because local governments have made it easy for me to dump my recyclables in a can that they pick up every two weeks. Not real sure if I am helping or not, but I feel good about it. Yet when I read about water contamination and such I wonder about those companies, governments etc and think they should be more concerned over sustainability. Obviously I am not paying much attention to social media regarding the above. Yes, social media does influence me to try some patterns or some fabrics. I really just go with what I like and that suits me. I have not been sewing as much as I use to or would like to; being retired seems to keep me busy doing other things. I like to sew what I like and with change in my life I am still trying to figure out what I want/need to sew. I have mostly sewn work clothes and just don't need that now. As to Burda, I quit getting the magazines a couple of years ago. I find that if I see a Burda garment made up by someone and I like it and suits my needs, I can usually go to Burda website and download the pattern. I still have some magazines that I accumulated and every now and then I go through them to see if there is something I want to sew. Normally not. As to cranky, you aren't and if you are you own it. I like your posts and your honest review of garments you sew. I find that I like some things you sew and others don't appeal to me but they work for you. I read to learn how others sew things, to see what they are sewing and would it work for me or even how they solved a problem with something they are working on. Girl, you are nowhere near old, I am though, I have birthday in January and will be 68. My brain does not tell me that but my body does! As for sewcial media, I have to say I *enjoy* seeing what everyone else is making, but I can't remember it ever influencing me to go out and buy a pattern. I suppose it did introduce me to Burda back in the day (like pre-Instagram back in the day), and that was a deep rabbit hole to fall into, but I really love my Burda stash and I don't regret it. As for the sustainability angle, it's something where I feel like I want to do better on a personal level, but I'm also aware that there seems to be a lot of judgement around this topic. I realize that my own choices won't have nearly the impact that a large scale manufacturer will have, but it doesn't mean I don't want to do better where I can. It doesn't mean I hold other people to those expectations, or that I judge other people for their choices, because I can't know their situation. I'm also of the opinion that the Earth is going to outlive us (it's hard not to think that way these days), but that doesn't mean I feel like I should be needlessly or mindlessly wasteful. It's tricky though, and I in no way think I'm perfect, so I really can't judge others for the same. And I can't really see how a large wardrobe is "wasteful" if it gets worn? I honestly feel like sustainability is something I focus on more in other aspects of my life, because I think those things are more impactful. Either way, I similarly refrain from posting about it, because of the judgmental nature of things on social media, but it doesn't mean I don't like to learn more about what my options are, so I can make informed choices. Plus, I get to learn about all these new textiles (like mushroom leather!) that hopefully will find their way to the home sewing market at some point, which could be really cool. You are not a cranky lady! You actually bring up a lot of great points! Regarding sustainability, I never really think too much about it, so I am not aware of the reason for such a push toward sustainability and "slow sewing." Also, I did see a lot of versions of M7833 on IG a few days ago, and I felt overwhelmed by it too, lol! At the end of the day I always enjoy celebrating the art of sewing, and love to see what others create even if I know I wouldn't make it myself. I fully admire talent in any form. That said, I love your boatneck top, and your dress!! I don't know where it came from but it arrived like, BAM! I am assuming it's a product of the whole minimalism / Kondo effect. I LOVE seeing what everyone is making. Love it!!! My rambles: Sustainability of my mental health is my focus. I am too old (and cranky hah!) to be foolin' with others' opinions and stuff. I do what I do and keep it moving. I have not purchased the McCall's side ruching dress not because everyone is making it, but because I'm sure I have something similar to that in the stash already. You're right: the bateau neckline is very nice and this top fits quite well. I think about doing those Instagram pic-per-day prompt things and "nope" right out of it in 30 seconds. I tried it once and maybe made it to day 4 or something. Thank you :) I AM sometimes influenced by the people who I have similar tastes and/or body type as. I will say that...but the "everyone's doing it!! ", eh. Certainly not an 'old' cranky lady! However, being a 'grumpy old woman' is something I aspire to and I'm half way there already. I don't make a pattern just because I see it made by a lot of other people on social media. I make it because I like it and think it will suit me. I'll use a pattern many times, and wear my clothes forever until they fall apart. I'm going back to using wool and wool blends for trousers, I've tried synthetics and do not like wearing them. I love sewing and wearing linen, cotton and wool so I guess that's my nod to sustainability. Hahaha! :-p Same! I always tell my kids I'm going to be the "cranky, get off my lawn" neighbor lady!